While planning ahead is the best way to get the most out of the few days a year you have to rest, recharge, or explore somewhere new, there are little tweaks you can make from the airport or even once you arrive, to tailor the trip to your needs according to availability. Hopefully you have the foresight to look into other travelers’ recommendations or call the places you hope to visit, however. If you do this before even buying your ticket you may find you save yourself stress, as well as money, and you’ll be able to choose the best times to get the most out of each activity. If you’re planning to visit a rave or go nightclubbing, maybe a busy spot is exactly what you’re looking for! But should you prefer a bit of tranquility or simply fewer people blocking your view of the landscape, start by working out the high and low season at your destination. If you waited till you arrived at your hotel to start planning, it may be too late to consider busy and quiet seasons, but if you have time to do so beforehand, or adapt your activities on arrival, ask around about what is considered “high season” in the country you’re visiting. As many of you know, I spent several months living in Playa Del Carmen, where I went on whale shark tours of the largest known gathering of whale sharks in the world. The first time I took the tour during the low-season and the second time I went (less successfully) in high season with friends. The season begins around mid-May and runs all the way into September, but can vary according to the weather and shoals’ migrations. The first time we were very few people amid dozens of sharks; in high season of course there is more risk of hurting the animals and overcrowding them with other tourists. This advice applies to whale watching, swimming with dolphins, turtles, or even snorkeling along coral reefs. The Crococun Zoo, which I saw in the same area, lets you get up close and personal with previously wild animals, not just displaying them behind bars and glass. But this is much better when it’s just you and the animals, otherwise you may have to queue or overwhelm the zoo’s inhabitants. Any activity that you do involving wildlife will be much more enjoyable for you, and kinder to the animals if you don’t join the swarms of people during high season. Having traveled the world for so many years I’ve stayed in a huge variety of accommodation styles – from camping to 5 star hotels, I’ve got a solid idea of what to look for in a hotel! I’d recommend for smooth trip with plenty of options should something not go as planned, to look into what a hotel or resort can offer you onsite. Many companies offer tours with pick-up points at major resorts. 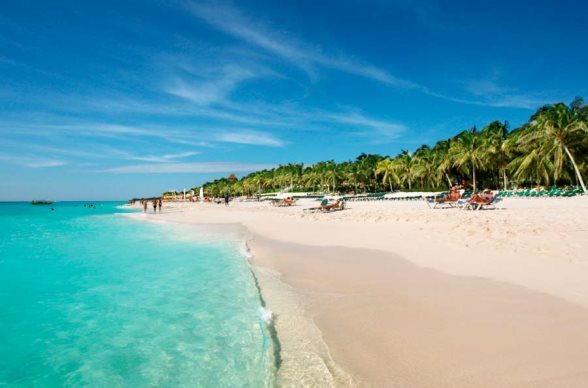 If you prefer to let the resort do the organising and happen to follow me to the Easternmost point of Mexico, the tours and activities in Beloved Playa Mujeres are worth looking into for Mayan ruins visits, trips to wildlife sanctuaries, or to try out a new water sport. Either before or as soon as you get to your destination, suss out the offering and what will require deposits, upfront payments, reservations, or simply arriving before the crowds do. Just as you have to get to the pool early to be able to enjoy a sunbed, to be able to surf in peace, or simply just to get on a tour bus to an even more exotic destination, you may need to plan a few early mornings. There’s nothing worse than planning to do something for a day and arriving to find it fully-booked, so when possible, reserve your spot in advance. It’s also worth planning alternate activities in case you need to use some time while waiting for a free spot on a tour for example, or simply have some flexibility in your plans to be able to move one activity later in the week or the day. As you’re planning, checking out the low-season, resorts, tours and activities, take the temperature at different times of the day into account. What I found in Playa del Carmen as much as the whole coastline fanning out from Cancun, is that the nights are a little fresher thanks to the sea-breeze but the atmosphere is simply warm and humid most of the day. Further up from sea-level, you’ll find noticeably cooler mornings and evenings as the sun drops, and it may be worth planning activities out in the sun for much earlier in the day so you can relax somewhere air-conditioned around midday. Whatever you decide to do and whenever, a bit of forward planning goes a long way. Simply evaluating the low season, the weather according to the time of year, allowing an expert or your resort to provide activity options, can vastly improve the quality of your trip. Once you’re armed with information, be prepared to use it to adapt your trip on the go, and let that flexibility dictate the order you check things off your bucket list.